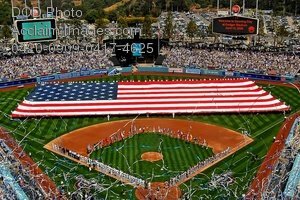 Description: Free, public domain image: Sailors and Marines Holding a Football Field Size Flag Across Dodger Stadium. LOS ANGELES (April 14, 2009) Sailors and Marines unfurl a football field-sized American flag at Dodger Stadium during the pre-game activities before a Major League Baseball game between the Los Angeles Dodgers and the San Francisco Giants. (U.S. Navy photo by Mass Communication Specialist 1st Class David McKee.